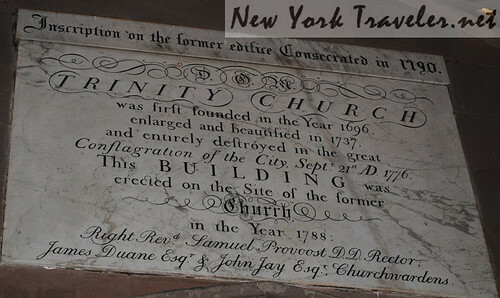 This is the second installment of our tour through Trinity Church on Wall Street in lower Manhattan. See Part 1 here. It’s an experience of extremes. The streets are hot and smelly and loud, filled with honking horns and diesel traffic and the deafening noises of subway trains moving below our feet, of millions of feet shuffling over the concrete Manhattan jungle…. but once you spot the iron gate, and climb the ruddy sandstone steps, and cling to the ancient wrought iron rail for balance, and walk up onto an enchantingly emerald hill several feet above the crowded sidewalks, it’s as if you’ve entered the Woods Between the Worlds. It is quiet. 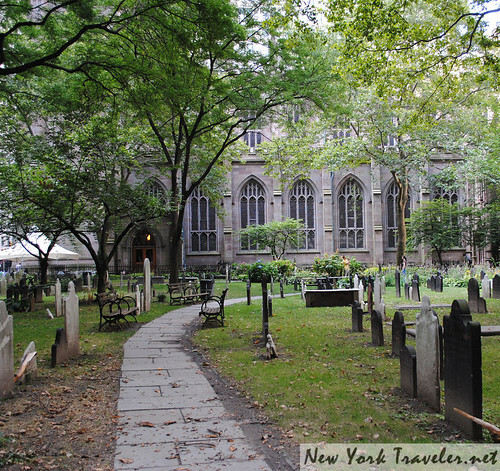 A whisper of a cool breeze blows over the stony tombstones and lightly tickles the honeylocust leaves. Crowds of people mingle here, too. 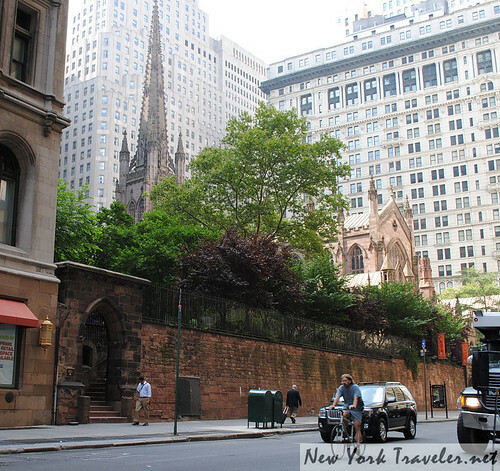 People are ubiquitous in Manhattan, without people there would be no Manhattan. It would be like no grasshoppers in the hot summer Upstate meadows, no mud in the Upstate creeks, no blackflies in the Upstate forests…. …but these people here are different. They are quiet. Maybe the lush green moss carpeting muffles the sounds. But even the chattering children and the businessmen eating lunch while chatting on cellphones seem quiet. We meandered around the grounds as I described in Part 1. 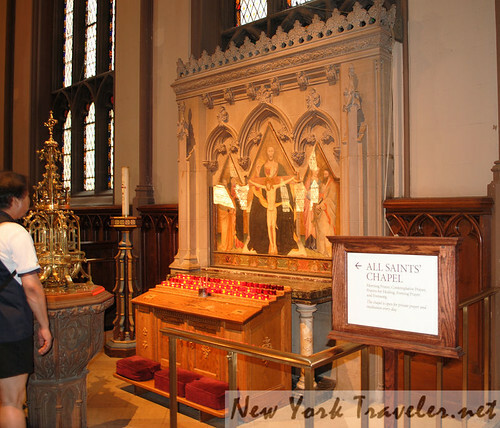 For this post, we venture inside the church. 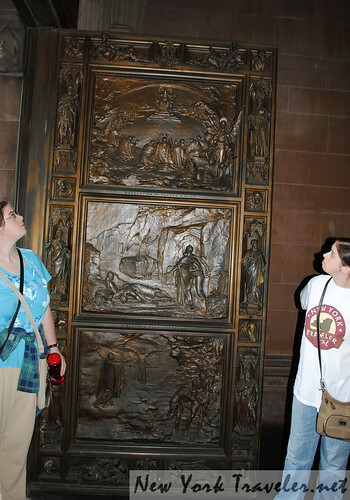 The bronze doors make a good first impression. 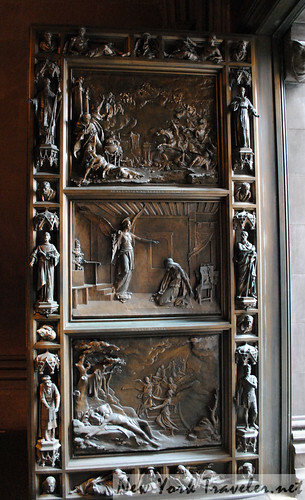 Weighty and ornate, they speak of Trinity’s past with a solidity not seen in modern architecture and art. 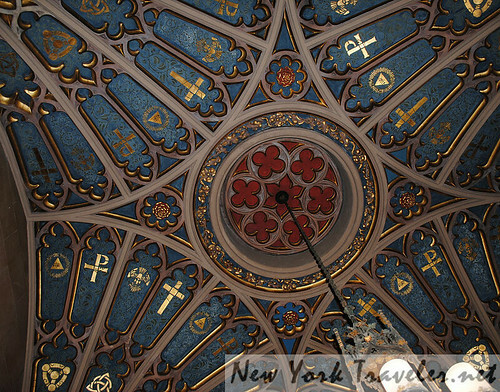 I’m a “ceiling person.” I look up and am awed. I stop to take photos, not caring if I block the entryway momentarily. Oddly enough, people wait. When I say, “Excuse me,” THEY SMILE. 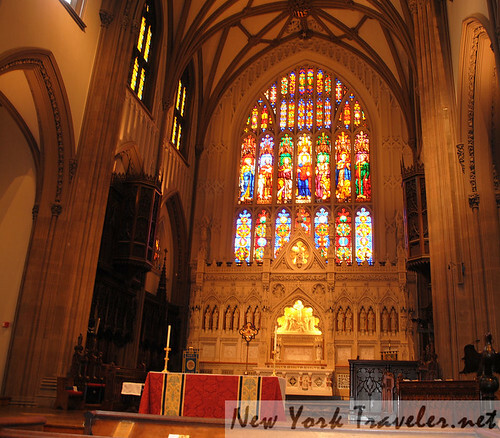 Trinity Church works wonders in Manhattan, indeed! The church is very dark. My photos are pitifully blurry, I apologize. Plus, my hands would not stop trembling. I can’t figure if it is the heat of the day, the long walk or the joy of returning to the church. Last summer, the day (and the church) was horribly hot and humid. 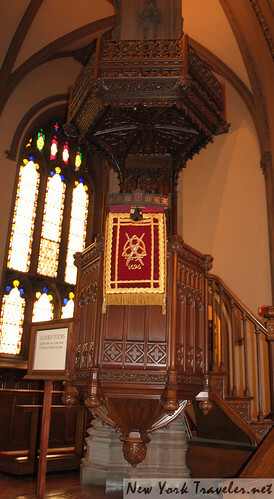 My camera had photographed grotesque clouds of haze and humidity above the altar. This time, the place was deliciously cool. 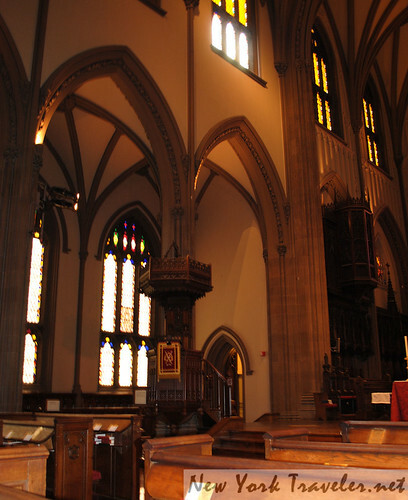 I sat down in a pew– partly from reverence, partly from exhaustion. Tourists mingle in and out. Some people kneel in the pews, quiet in prayer. Others noisily wander around the vestibule. We are behind a small group of Chinese tourists, chattering in their native tongue. One boy, about the age of 12, restlessly pushes ahead of the group. An alert security guard speaks up, “Take off your hat,” she says to the boy. He stares at her, puzzled. “Take off your hat, please,” she repeats, more forcefully. An older Chinese gentleman, perhaps the boy’s father, removes the boy’s hat. I am impressed. The guards are not here only to keep the candles from thievery, but to enforce respect for the church. Some of the Chinese children run past us, straight up to the altar where the gold glitters on the sacrament table. Another guard pipes up, “Please get down from there.” The boy gives a blank look. Again, one of the adult tourists waves the little boy down. I find the events rather amusing– not in a funny way, but just interesting. The children do not know how to conduct themselves in a church. It’s not limited to foreign children, by any means. I feel a little melancholy when I think about it. My attention is turned to my daughter, who nudges me and whispers, “This is it. This is where Hammy sat with his family.” Hammy is our little nickname for Alexander Hamilton, our hero. My daughter knows everything there is to know about Hamilton and his wife, Eliza. 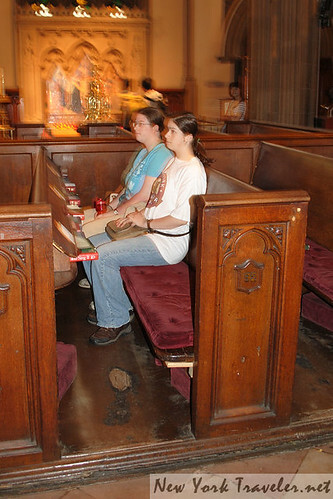 We sit reverently in the pew #92. 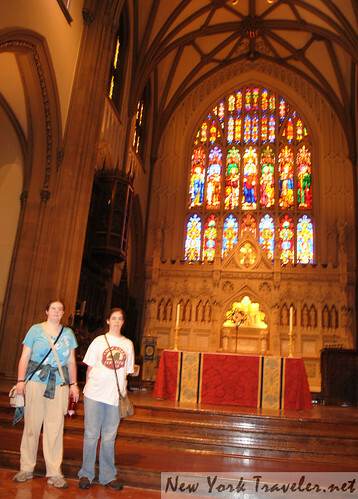 We wander the sanctuary, taking terrible photos because of the poor lighting and my poorer photography skills. The building is so beautiful. What?! “Where? !” I whisper incredulously. I have been to this church twice and never knew there was a hallway that led to a museum. Of course, she’s the expert– she knows the history of this church like the back of her hand. She leads me toward the museum… I’ll have to make a Part 3 for this part of our adventure, as there is much to tell!